I was watching Rachel Ray the other day and I saw a lady by the name of Lisa Lillien on Rachel's show. She had a website called http://www.hungry-girl.com/. It is more of an email subscription which I joined, but she has a lot of great recipes and tips for low fat and low calorie recipes. Watching some of the yummy dishes being made on the show, Lisa announced one of her new cook books called "Hungry Girl 200 under 200". 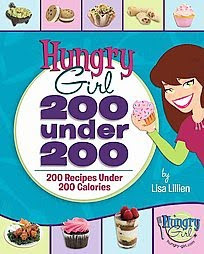 It means 200 recipes under 200 calories. I just got it in the mail yesterday and this was the first recipe I tried. 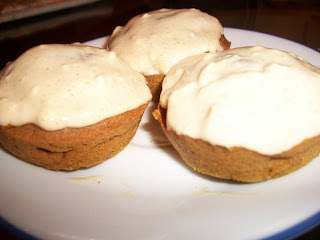 I can definitely taste the spice in this recipe, but the sweet cream cheese icing counteracts with it, making it overall a pretty darn good recipe. The icing is a bit runny considering it is made partially from cool whip so it must be refridgerated at all times. I suggest putting it on the cupcakes right before serving. So at only 112 calories a cupcake, you just can't go wrong. I can't wait to try another cupcake recipe from her book. She actually has a whole chapter on cupcakes. As Lisa would say, "Yay!" In a medium mixing bowl, combine all of the frosting ingredients, stirring until well mixed. Refrigerate until cupcakes are ready to be frosted. In a large mixing bowl, combine all of the cupcake ingredients. Mix well until blended. Line a 12 cup muffin pan with baking cups and/or spray with nonstick spray. Evenly distribute cake mixture among the cups. Bake in the oven for about 15 minutes, until a toothpick inserted into the center of a cupcake comes out clean. Cool cupcakes completely, and evenly distribute frosting among the tops.